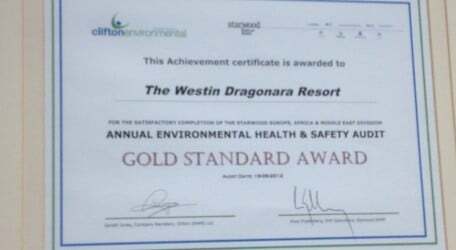 During the recent Health and Safety Audit, conducted by Clifton Environmental Services, the Westin Dragonara was awarded a Gold Standard Award. The criteria for this award cover a wide range of areas, namely: Management of Health and Safety, Fire and Emergency Safety, Engineering Safety, Food Safety Management and Practices, Security, Environmental Protection, Leisure Facilities as well as Childcare and Kids Club. The Westin Dragonara strives in offering guests and associates a safe environment; hence achieving this award and ensuring that all the required standards in Environmental Health and Safety are met makes this award an even more prestigious one to the hotel. ‘Considerable efforts have been made over the last five years which have produced a steady improvement in site health, fire and food safety. The 2012 audit has identified the best result to date and is a credit to the GM, Safety & Security Manager and dedicated team members. The achievement of a gold award is well merited’ commented the Clifton Environmental Services auditor.